Matt’s away, which means I can turn into a vegetarian for a few days. I thought some lentil stew would be a good dish to start with. This is a variation of a stew I came up with a while back, swapping out the carrots and kale for eggplant and red chard. I decided to roast the eggplant first so it wouldn’t turn to mush in the stew. It’s not truly vegetarian because I used chicken stock, but it can easily be replaced with vegetable stock if needed. Heat olive oil in a large pan over medium heat. Add onion and stir to coat with the oil. Cook on medium to medium low until browned, stirring occasionally, about 30 minutes. Meanwhile, place lentils in a pan and add enough water to cover by an inch. Bring to a boil then simmer, covered, until tender, about 20 minutes. Drain and set aside. 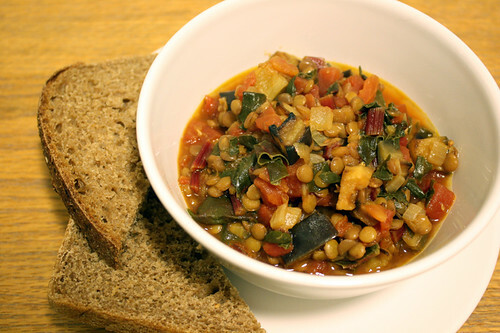 While the lentils are cooking, drizzle the eggplant with olive oil, sprinkle with salt, and roast until golden. I did this in my toaster oven and it took about 10 minutes, turning the pieces halfway through. 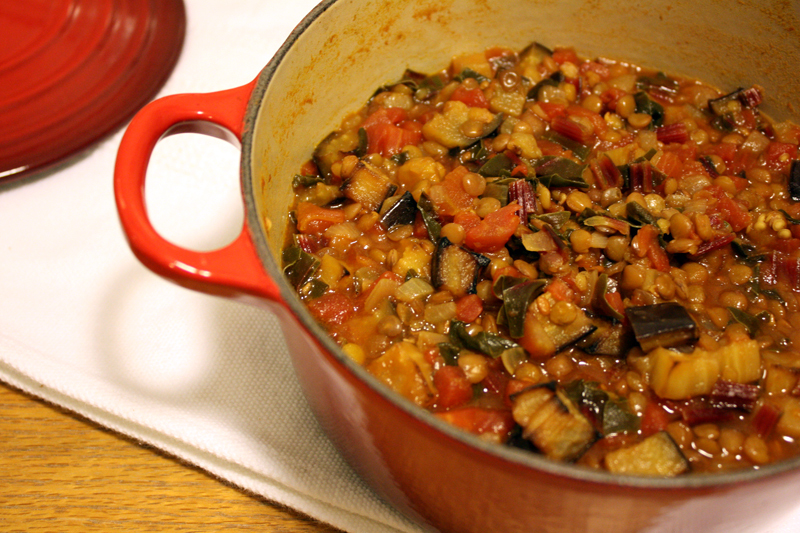 When the onions are browned, add the tomatoes, roasted eggplant, lentils, and chard. Stir together then add the stock and salt. Cover and bring to a boil, then lower the heat and simmer about 20-25 minutes. Serve with brown rice or whole grain bread. EDIT: I ate some of the leftovers with a little hot kimchi and it was very tasty. It would also be good with a little hot sauce.